Lamb is good, too, but ham is worry-free. Easter is coming up fast and I need to decide whether to have ham or lamb. As much as I love lamb, roasting a leg to its proper degree of doneness can be daunting, especially with a living room full of guests, so I generally opt for the much-more-forgiving ham. Whoever invented spiral-slicing is a genius. Slices can be easily cut off the bone, and it makes a beautiful presentation. A creamy gratin (otherwise known as scalloped potatoes) is a great accompaniment. Other elements to round out the meal could be asparagus mimosa (blanched spears topped with sieved hard-boiled egg), an arugula and apple salad sprinkled with crumbled blue cheese, and something special like chocolate tart (or chocolate Easter bunnies) for dessert. Baked ham does not need to be served hot. In fact, warm is actually preferable. Place oven rack to lowest position and preheat the oven to 275 degrees F. Remove all packaging from ham, including plastic disk covering bone, and place sliced side down in roasting pan. Cover pan tightly with foil. (Alternatively, wrap ham entirely in a large sheet of foil and place in pan.) Bake until center registers 100 degrees F, 15 to 18 minutes per pound. Meanwhile, combine brown sugar, jelly and ginger in a small saucepan and cook over medium heat, stirring, until mixture is thick and syrupy, about 5 minutes. 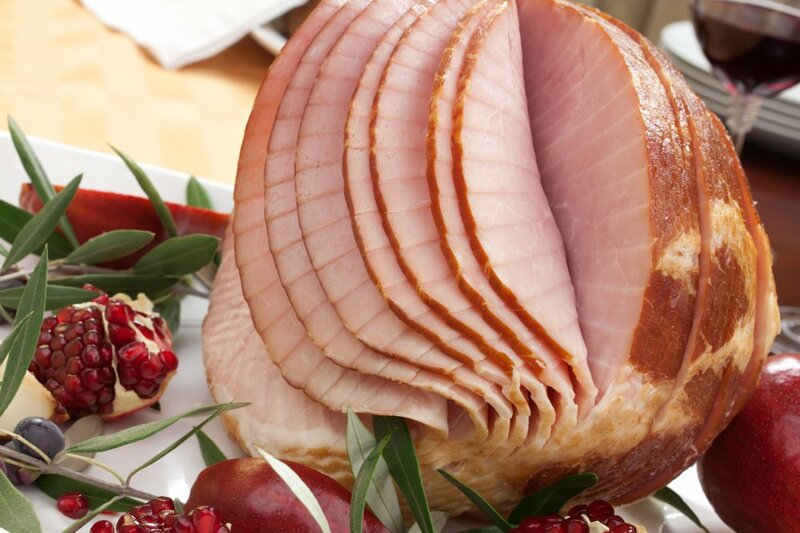 Increase the oven temperature to 350 degrees F. Unwrap the ham, turn cut sides up, and brush thoroughly with glaze. Return to oven and bake uncovered for about 15 minutes until glaze is sticky. Remove from oven, brush with glaze again, and let stand for at least 15 minutes before transferring to serving platter. If you have a really large oval gratin dish, double this recipe. It’s pretty much the centerpiece of the meal. No celery root available? Just make with all potatoes. Preheat the oven to 400 degrees F. Sprinkle the gratin with the cheese. If it’s warm, bake uncovered for about 20 minutes, or until the cream bubbles around edges and the top is golden brown. If it has been refrigerated, sprinkle with the cheese, cover the dish with foil, and bake for 30 minutes. Uncover, and continue to bake until the cheese begins to brown and the cream bubbles, about 30 minutes more. Sprinkle the gratin with the remaining 2 teaspoons of thyme, and let rest for 10 minutes before serving.